Potomac used to be farmland, and those roots are still evident. As you drive through Potomac, you’ll see white horse fences, rolling hills and streams winding through back yards. Potomac Village is the “heart” of Potomac, and offers shopping and dining. Schools in Potomac are excellent and there are several neighborhoods that offer convenient access to downtown DC. Potomac has been called one of America’s top-earning towns (CNN money.com) and one of the top educated towns (Forbes). Walk around Potomac Village shopping center on a Saturday morning and you'll get the vibe of the village instantly. Moms sip Starbucks coffee as the kids run around the little court. Weekend-warrior dads debate the merits of power saws in the hardware store. The same Saturday evening brings couples out on date night, late-night grocery store runs and laughing teenagers. You'll find croissants, bagels, gift stores, pizza places, doctors and dentists in this adorable square, which anchors the community known as Potomac Village. This part of Potomac is less urban than Bethesda, so you'll find bigger yards and fewer sidewalks. The area boasts numerous public schools and is in the popular Churchill district. It's also close to many good private and parochial schools. Many residents work in DC and Virginia given the ease of the commutes...this is a family friendly, pet friendly area offering plenty of room for growing families. Mention Fox Hills, or Fox Hills West, or any of the neighborhoods flanking the Cabin John Shopping Center and Mall, and someone will mention how fantastic the schools are. Someone else will tell you that the shopping center is a city unto itself, and someone else will extol the virtues of larger yards and the deer who visit them. Someone with kids will tell you how great the year-round ice rink is, and someone else will tell you how much they love the train rides through the cool and shady park. 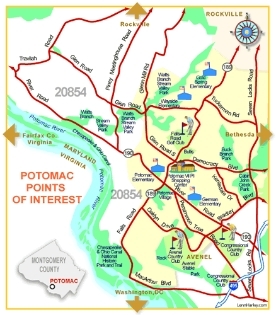 This part of Potomac boasts all of those things, plus proximity to 270 and a straight shot (down Seven Locks Road) to the Beltway. This area is suburbia at its best, and those who raise families here would enthusiastically agree. “To anyone desiring to have a good experience selling their house… We chose Mary Murphy to sell our house and were very pleased. Mary was extremely professional in how she marketed our house which resulted in a sale on the first day at above the asking price. All of our friends and neighbors that looked at the open house were really impressed with how well the house showed. The favorable appearance did not happen by accident. Mary made recommendations on painting, which modernized the look, and staging which emphasized positive aspects of the house that would have been overlooked. She was extremely helpful in providing resource service people at a reasonable price to fix things that needed to be addressed due to inspection. We were in Florida trying to sell the house and would not have been able to address these issues without her help. The buyers told us that they were very impressed with the amount of information that Mary provided them about the operation and maintenance history of the house. She prepared thoroughly for every step of the selling process and attended to all details in a timely way. "She has a knack for presenting and pricing homes" says Allied Realty President/Broker Eric Hough, who describes Mary as personable, professional and service-oriented. Copyright© Mary J. Murphy, All Rights Reserved.